A.A. Mikulin was one of the first Soviet designers who created aircraft engines suitable for mass use, which withstood the test of long-distance flights and war. In the early 1930s, under the leadership of Mikulin, the first Soviet aircraft engine of liquid cooling M-34 was created, on the basis of which a number of engines of various capacities and purposes were built. Under his leadership, a number of turbojet engines of various types were developed (including the AM-3 engine for the Tu-16 and Tu-104 aircraft ). Mikulin often said that aircraft engines belong to the kind of technology that can become outdated before being put into operation. Alexander Mikulin was born on February 2, 1895 in Vladimir. Mikulin's father, also Aleksandr Aleksandrovich, was a mechanical engineer who graduated from the Imperial Moscow Technical School (Moscow State Technical University na Bauman, now MSTU). Subsequently, he worked in Vladimir as a factory inspector. Mikulin's mother, Vera Egorovna, was the sister of Nikolai Yegorovich Zhukovsky. Childhood Alexander Mikulin Jr. spent in the estate of Zhukovsky, was brought up under his influence. Alexander showed a passion for design in early childhood. So, he decided to raise buckets of water from a well using a steam turbine designed and built by him. When tested under low load, the turbine worked normally. However, when trying to force a turbine, "giving in to a couple," the designer suffered a setback: the boiler exploded. The inventor himself suffered a little. Thus, the first acquaintance with a turbine engine in his life took place. Even in his childhood, Alexander mastered German and French quite well. Subsequently, this was useful to him: in Kiev, Mikulin entered the Ekaterininskoe real school, where teaching was conducted mainly in German. Since childhood, he was engaged in the flight of airplanes. He studied, in general, not bad, but without much diligence. The exception was the physicist. Young Mikulin loved tinkering, giving way to his passion for design. Quite by chance, he met a German Schreiber, who worked as a driver and mechanic at a Daimler-Benz private car under a contract. Thanks to this acquaintance, Alexander seriously became interested in studying automobile motor, helped to sort through it, learned to drive a car. Since then, Mikulina captured the idea of ? ?creating a motor of its own design. He began to throw various options for ICE, as well as steam turbines. One of his original ideas was related to the scheme appeared later Wankel motor. Alexander even began the practical construction of an internal combustion engine in the physical laboratory of the school. However, he violated the rules prevailing in the school, and failed to complete the creation of the engine: it all ended in scandal. As a student, Alexander listened to the lectures of NE Zhukovsky, was familiar with novice designer I. I. Sikorsky. In the spring of 1914, Mikulin successfully passed the exams for the second course and received permission to transfer to ITU. Soon he moved to Moscow, settling in the apartment of Zhukovsky. In Moscow, student Mikulin was actively involved in the work of the aeronautical circle of Professor Zhukovsky. Even then - among the equal members of the circle - Mikulin stood out for his outstanding design talent. He drew excellently, and his sketches of the original arrangements of various mechanisms differed extremely accurate graphics and completeness of technical solutions. Alexander proposed a number of design improvements for the laboratory and experimental equipment used by the circle. In August 1914, the Great War began. Soon N.E. Zhukovsky, who was considered the most authoritative scientist in the field of aviation and hydrodynamics, took the post of head of the department of inventions at the Military Industrial Committee. Zhukovsky wrote the famous work "Airplane bombing" and announced a competition for the development of aerial bombs. Among others, Mikulin was commissioned to create an incendiary bomb. Tests of a fairly wide range of aerial bombs were carried out at Khodynka. The best incendiary bomb was recognized as a design developed by Mikulin himself. He was awarded an honorary diploma and a prize of one thousand rubles in gold. The latter, however, was recommended to donate for the needs of the war, which he did. In 1915, together with Zhukovsky, he took part in the development of the Tsar-tank. After the October Revolution, Mikulin worked in the laboratory for aviation of the Moscow Technical University of Technology, in the Committee for Inventions, then under the guidance of Professor N.R. Briling designer developed in TsAGI snowmobile. In 1924, Mikulin was commissioned to independently develop a low-power motor for T-19 tankettes. The motor was accepted into production and released in a small series. He became the second tank engine created by Mikulin. Then, low-power Alpha and Beta motors were designed and built. In 1926, Mikulin became the chief designer of NAMI of aviation engines. With his participation, the NAMI-100 (M-12) engine with a power of 100 hp was developed, designed for the U-2 training biplane. However, the deadline to complete the motor failed. Part of the failure can be explained by the death of Mikulin’s father, since all the worries about the family from that moment fell on Alexander’s shoulders. Another, more developed M-11 engine, designed under the guidance of A.D. Shvetsov. The Soviet air fleet badly needed a powerful engine to create effective heavy bombers. NAMI was tasked to develop a 700 hp aircraft engine. Brilling personally led the process of designing the engine, which received the name M-13. On the M-13 was made the main rate. The development of drawings of the motor led by Mikulin. Prototype samples expected to collect at the motor plant named MV Frunze, formed by the merger of the plants "Motor" and "Icarus" with their subsequent reconstruction. In 1928, the first three experienced M-13 engines arrived for testing at NAMI. Already the first tests of the novelty led to disappointment: the M-13 was able to develop a power of no more than 600 hp. Then began even bigger trouble. In the course of work, the engine began to collapse: the plates of the valves broke off from the rods and, crumpled by pistons, flew into the manifold. The same happened with the second and third prototypes. The failure of the M-13 undermined the belief in the possibility of creating a powerful aviation engine on its own. This point of view was also shared by the new leader of NAMI Zelinsky. But Alexander Alexandrovich Mikulin did not intend to retreat. He believed that as a result of developments, including unsuccessful ones, an invaluable design experience is accumulated, without which it is impossible to create a workable machine. In 1930, Mikulin set about implementing an idea that had matured in him in 1928: the creation of an engine that was superior in power to the M-17. At the initial stage, he encountered serious opposition from the leadership of NAMI. Despite this, in May 1930, Mikulin was able to achieve the approval of the proposed layout of the motor. The development of working drawings was completed by July 1930. In October, tests of the experimental unit began, and by August 1931 a running-in and preliminary testing of the "full-scale" motor was carried out. From August 2 to November 7, the engine, designated M-34, successfully passed 100-hour state tests and in early 1932 was transferred to mass production. M-34 possessed outstanding technical data for its time and surpassed the best foreign models. Its rated power was 750 hp, and take-off - 850 hp. with a dry weight of 535 kg. Simultaneously with the preparation of the M-34 engine for the introduction into the series, the development of a reducer, a supercharger, and a variable pitch propeller began in order to improve its technical characteristics. In 1931, the design of the gearbox version of the M-34R was completed, and the design of the M-34N engine with a two-speed supercharger, which provided an altitude of 5,000 m, was carried out in parallel. The M-34RN motor, equipped with a reducer and a supercharger, passed state tests in 1934. The director of the Soviet pavilion at the 2nd International Aviation Exhibition, held in 1934 in Copenhagen, noted in its report that the visitors showed the greatest interest in the M motor. -34PH, which in terms of decoration and technical data was not inferior to foreign ones. The M-34 engine in various versions was installed on a number of production aircraft, such as TB-3 and I-Z. The same engine was equipped with the world's largest aircraft, "Maxim Gorky". Of particular note is the use of M-34 on airplanes RD. In 1934, the crew of the pilots M.M. Gromova and A.I. Filin, navigator I.T. Spirin was made a flight at a distance of 12,411 km along a closed route. The plane was in the air for 75 hours, which was comparable to the resource of the engine. In 1936, the crew of V.P. Chkalov, G.F. Baidukova and A.V. Belyakov on the RD (ANT-25) aircraft with the M-34 engine made a non-stop flight on the route: Shchelkovo - Kamchatka - Odd Island, 9374 km long, and in 1937 they also made a flight on the route Schelkovo - North Pole - Portland (USA) with a length of 8509 km. In the same year, the crew of MM. Gromova, A.B. Yumasheva and S.A. Danilin made a flight on the route Schelkovo - North Pole - San Jacinto (USA) with a length of 10,148 km. At the same time a new world record was set for a straight-line flight range without landing. Flights to America were carried out on completely untapped routes, in very difficult weather conditions. So, the crew of Gromov collided with three cyclones during the flight. "American" flights became a real triumph for Soviet aviation, its pilots and navigators, the aviation industry and, in particular, the domestic engine building industry. In January 1935, by order of the People's Commissar of Heavy Industry Sergo Ordzhonikidze, Alexander Mikulin was awarded a passenger car for his successes in creating the M-34. At the beginning of the 1940s, AM-38, AM-38 FN and AM-42 appeared. Reliable engines produced massively. Mikulin brought the piston engines to perfection. Mikulin always sought to attract strong, creative personalities to work in his team. He offered the position of first deputy to Sergei Konstantinovich Tumansky, in the recent past, the chief designer of the Zaporizhzhya plant * 29. On the eve of the war, the plant was introducing the M-87 and M-88 motors. Mastering was accompanied by great difficulties, and when they were already largely eliminated, as we sometimes had, Tumansky was removed (his predecessor, AS Nazarov, was even worse - he was repressed). Knowing that a number of the largest motorists in the country are in custody, Mikulin was not afraid to turn to Stalin with a request to appoint Boris Sergeevich Stechkin as his deputy for the scientific and experimental part of one of these "convicts". The future academicians, future academicians, the founders of the national cosmonautics S.P. Korolev and V.P. Glushko. On Mikulin's letter concerning the fate of Stechkin, the Supreme wrote: "To hand over to Mikulin. Stalin." How to execute this order is not very well understood by the NKVD, but once ordered, they must be carried out. After a couple of weeks, an unusual group appeared at the entrance of the plant: an NKVD lieutenant, two arrows and between them - a gray-haired man in a padded jacket and felt boots. The lieutenant demanded to take everyone directly to the chief designer: "Are you Mikulin? I have been ordered to transfer you *" So at the factory * 300 the creator of the theory of the air-jet engine appeared. During the Great Patriotic War, he also led the creation of powerful engines GAM-35f for coastal defense boats. In 1940, Aleksandr Aleksandrovich was awarded the title Hero of Socialist Labor, and in 1943 he was elected Academician of the Academy of Sciences of the USSR. In 1944, the aircraft designer was given the rank of Major General Engineering and Technical Services. In the postwar years, the question of gas turbine engines was discussed. Mikulin, his deputy for design, S.K.Tumansky and the deputy for science, B.S.Stechkin, were instructed to create an engine with a greater burden. In 1947, the first turbo-compressor jet engine TKRD-1 with a thrust of 3780 kilograms of force was designed. Later, according to his scheme, more and more powerful engines were created. Mikulin, nevertheless, strenuously continued to work on improving his piston engines, as mentioned above, and all the questions - would he not be engaged in jet engines, always answered: "In my age, there are enough piston engines!" On February 26, 1946, the historical decree of the Council of Ministers of the USSR * 472-191 was signed by Stalin, according to which the plant and personally Mikulin was given the responsibility for the design and construction of experimental turbojet engines. On an emergency basis, Mikulin gathered all the heads of the plant’s subdivisions, announced the release of the ruling, and stated that all work on the creation of a turbofan engine was henceforth of paramount importance, the solution of which should direct all the plant’s activities. Mikulin warned that the engine must be designed, manufactured and tested in the current year. Mikulin changed the structure of the bureau. The group of superchargers turned into a group of compressors. It was headed by P.F. Tooth, later the chief designer of the design bureau of the plant #16. The group of turbochargers became a group of turbines. It was headed by V.I. Sorokin, he later became chief designer of the design bureau at the plant #26. In addition, Mikulin invited prominent designers from other organizations to the plant. During this period, Mikulin, having forgotten about all his illnesses, came to the factory early. He left when the main issues were resolved, sometimes at night. The Mikulin Design Bureau created powerful engines for jet bombers and passenger aircraft. Among them was AM-3 and its modifications with a load of up to 11,500 kgf. The industry produced them since 1952. These engines were installed on Tu-16 bombers, Tu-104 planes and long-range bombers. Developed engines were in the service for over 20 years. They were distinguished by reliability, great resource and maintainability. In the early 1950s, on the basis of scientific research in the Mikulin Design Bureau, powerful engines with a low specific gravity and overall dimensions were developed. One of these engines RD-9B is widely used on fighters. Mikulin introduced the regulation of heaters with rotating vanes, two-speed heaters, high inflating and cooling of the air in front of the carburetor, developed the first domestic turbocharger and variable pitch screw. Mikulin, who had a fine understanding of people, very skillfully selected employees. It is not surprising that he had a large cohort of the most talented designers of the then USSR. It should be added that Alexander Alexandrovich had such authority that it was flattering to every engineer to say: “I work for Mikulin!” He had a rare gift, combining the breadth of design solutions with the elegance of detailed work. Being a brilliant engineer with enormous prestige, Vladimir Ivanovich at the same time remained modest and even shy. Vladimir Ivanovich was hard and uncompromising in disputes. Creating a machine, and especially such as a gas turbine engine, is a difficult and painful process. It involves many people of varying degrees of talent, efficiency and perseverance in making a decision. Therefore, sometimes it turns out that a less talented but more assertive engineer pushes his own version, and then it turns out that he was far from the best. Technologists and production workers had to re-learn how to manufacture blades, large body parts, heat-resistant disks, etc. As soon as the technologist began to decide how to make this or that detail, he immediately had thoughts about its constructive simplification. And the designers have already linked everything, and any change leads to a chain of repeated decisions. 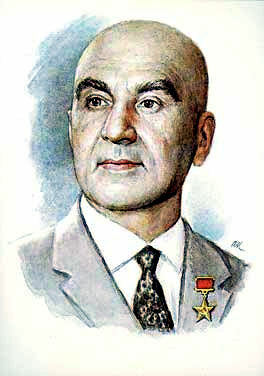 When Mikulin was removed in 1956, Tumanskii was appointed General Constructor of the renamed bureau. The outstanding activity of the largest Soviet designer aircraft engines ended abruptly in 1955. After the dismissal of the Chairman of the Council of Ministers of the USSR G.M.Malenkov, who highly valued the activities of A.A.Mikulin, the Minister of Aviation industry P.V.Demoviev decided to get rid of him. Mikulin was not only removed from the post of chief designer, he was generally suspended from work in the aviation industry. An old comrade and colleague of Mikulina, Academician B.S.Stechkin took Mikulin to work as a researcher in the laboratory of Engines of the USSR, where he worked until 1959. On pension Mikulin remained the same restless and creative person who was always. The inquisitive mind of the constructor addressed not only engines. After a heart attack, A. A. Mikulin developed an original system of recovery, which he described in his book Active Longevity (my system of struggle with old age). He became interested in the influence of static electricity on a person and suggested periodically to ground the human body and increase the humidity in the room with the help of an ionator, which he himself invented. When the Ministry of Health refused to publish the book of Mikulin, dedicated to medical subjects, academician in 76 years enrolled in the Medical Institute and in 1975 passed the "excellent " state exams. The following year he defended his PhD thesis in Medicine on the book he had prepared. Then it was published under the title "Active Longevity ". All his medical ideas were tested on himself, and having in the middle of life big problems with health, managed to strengthen the organism and to reach his 90th year. Alexander Alexandrovich died on May 13, 1985 and was buried at the Novodevichy cemetery in Moscow. Major General of the Engineering and Aviation Service (19.08.1944). Laureate of the Stalin Prize of the USSR (1941, 1942, 1943, 1946). He was awarded with three orders of Lenin (28.10.1940, 2.07.1945, 24.01.1947), Orders of Suvorov 1st (16.09.1945) and 2nd (19.08.1944) degrees, three orders of the Labor Red Banner (10.07.1943, 10.06.1945, 14.02.1975), orders of Friendship of Peoples (14.02.1985), Red Star (21.02.1933), "Badge of Honor " (13.08.1936), medals, including "for combat merits" (05.11.1954).